There's nothing quite like the sensation of the whole extension ladder bouncing while one is over ten feet in the air, and having the wind pick up and go stiff enough to make the whole ladder feel like it's shifting. Plus having the odd knowledge that if I actually dropped the paint bucket it would have a very long way to fall after I'd released the hook from the rungs. I did better today, though not from having a good night last night. I slept pretty poorly between a combination of digestive problems, having muscles that just couldn't relax, and from having odd dreams of not following a code to the letter, but doing just fine by the spirit behind the code. That was interesting. I actually moved quite slowly all day, but when I was on extension ladders, doing the second-story work, that was an okay thing, on the most part. John and I got up as part of the breakfast crew, but two other folks had woken nearly half an hour before we had, and had French Toast and Sausage well in hand, so John and I did a lot of the work setting up the lunch stations, where folks could make their own sandwiches and pack their own lunches with the chips, vegetables, and fruit that they wanted. We left before 8:30, and made it out pretty easily, and were on the road. Our plan included going the extra seven miles to Alabama this time, and we did, and stopped at a truck stop. While it had a Krispy Kreme sign on the advertising post, there were no donuts in the shop. At all, so we just got all kinds of coffee and headed to the site and to work. It was just one car's worth of folks, so we had seven people working instead of the fourteen of the previous two days. We thought we'd be done with the house by the end of the day, but there were so many thing to do and there was some rotted out facia that the manager suddenly said that he wanted us to deal with. Initially, he'd said not to bother with any of that stuff, just to put a new coat of paint on it, rotted or not. But when he saw what Clay could do, he had him replace a number of rotted boards... but that was the end of the day. Our smaller crew knew how to work together, and we had a good time painting, caulking, and John and I did all the really far-up stuff, including finishing the painting of most of the eaves, and touching up all the corners with a brush. John found an extension to the roller and he was able to get it up into all the places that needed paint. The tricky part was that all the corners had to have a person with a brush take care of them, but that was a lot easier than trying to paint all the surfaces as well. So I went up and did most of the touch up. John did some of it as well, but I managed to do a lot of the high-up stuff after the first couple of times, it got easier. And the really, really high up stuff made the lower stuff seem like a piece of cake. 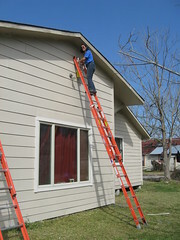 I was going up the folding step ladders like they were nothing after the extension ladder. *laughs* That was a very cool side effect of the whole thing. I have to admit that on the extension ladders, occasionally, I had to remind myself that it was perfectly safe, and that my fear was simply fear. It's real, but not necessarily something I should listen to if I wanted to get the job done. Sometimes there are advantages to being so completely goal-oriented as I am. At lunch time I had to get more caulk for the crew as we'd gone through all dozen tubes. I'd been to the hardware store before, so it was easy enough to find the place and get the stuff we needed. When I got back everyone had lunch, and I slathered up again in bug repellent as it was a warmer day and the bugs were starting to get out and start nippng me again. I'm covered in bug bumps now. My throat, arms, and even my hands have bug bites all over them, and Clay was getting bit pretty hard as well. By the end of the day everyone was getting bit. Russ and I were working on the same side of the house and started slapping ourselves at exactly the same moment and he said, "Hey, did the bug spray just wear off?" I put more on and it didn't help at all, they just kept biting, and later we were joking about how, at least, we hoped we tasted bad. So it got kind of frustrating getting told to do extra stuff because they'd liked what we'd done so much. The whole house now looks coherent. With the eaves all the same colors as the body of the house. The trims all match, now, and the trim along the corners of the house cover up all the ragged and beaten up edges and metal edges. The front porch was completely repainted, as well as refaced on some of the areas. And all the sides now match. So it's really nice now. Melody came out to sit on the lawn to watch us finish off what we could. She and I talked for a little while. Her son came out as well, and he actually gave Jenifer a book he'd finished reading. I was pretty impressed by that, as was Jenifer. His name was Verno and he was pretty impressed by us as well. She ended up taking a picture with all of us and she said that she was really, really happy with how the outside had turned out, as it was better than she had ever imagined it could be when she was given volunteers to do it. The college students the week before had done some of it, but they didn't have the experience we had on how to actually finish the outside of a house and make it weather proof with caulk and how to make the trim and paint look really good. By 5:30 we were all exhausted and we'd loaded most of the heavier equipment into Tommy's truck, but there were a few things left to do, so we left some things. Then we hauled back to Biloxi for showers and then went all the way back out to eat at The Shed. We've eaten there every year so far, it's a BBQ place that is, literally, a shed, with a few things built on outside, and a picnic area with a bunch of picnic benches and a fire pit. They even sell a little plastic tub with everything you need to make s'mores by the fire. I didn't get the kit, but I did get a huge pecan praline. *laughs* Along with the spare rib plate with the baked potato salad and the famous baked beans. They were all really good with the slices of white bread that came with the platter. It was fun. And so tasty I didn't say anything for the first fifteen minutes as John got Tommy and his lady friend to talk about Katrina and the aftermath as they'd seen it. The baked potato salad has bacon, green onions, sour cream, cheddar cheese, and all the things you'd think of in a baked potato, but cold and creamy. The spare ribs were so tender I could cut them with a fork and the cartilage ends were cooked so long and slow that you could eat them nearly whole. Tommy had been in Pensacola doing disaster relief with FEMA for Ivan when Katrina hit Waveland, MS (that's where the eye of the storm was), and as much as he lamented not being home for the storm, he acknowledged that because he was, he was the only one in his family that had a working vehicle when he got back two days later. He talked about cold showers at Keesler Air Force base, once they'd squeegeed out the mud from the shower stalls. Doing runs into Alabama for clothing, food, gas, and water, and all the adventures while they were in their home own with houses slid into the streets, and debris everywhere. It was very interesting to listen to. Especially the morning he'd come home from a gas run at 2 am to find that his parents' house, which had been full of all the stuff he'd bought on the previous runs to be nearly completely empty. "Momma! What happened?" he asked, wondering if he needed to get his Daddy to use a gun to protect themselves. "Nothin' happened, the neighbors just needed it. So I gave it away," she answered, peaceably. Tommy threw up his hands at that and just said, "Well, that's the way we are, I guess. That's just the way we are." But I was tired. I seem to be very tired, but not as achy as I was yesterday. Maybe I figured out how to relax on the ladders after having been THAT high up, and sophiap's comment yesterday reminded me to stretch between the times when I was up on those ladders, and that helped a great deal. Anyway... it was a good day. We nearly finished the house and since I'm the driver, I'll probably be able to help John and Clay with the last hour's worth of work left. That should be good. And everyone else will move onto another project. It's kind of fun to see one all the way through. Click on any of the pictures to get to all the cool pictures that I've uploaded. The Biloxi 2009 picture group is in chronological order, whereas the photo stream is not. I am weeding through them more this time compared to last time. Vicki rode with me back to the convent, John went with the other younger folks to the casino. So I might as well take advantage of the quiet and go to sleep... I got to call Jet just before he went to sleep, and he sounded just fine, a little tired too, but happy. That was good. I miss him, too. Bravo re all the work, and eww on the bug bumps! Yeah... ewww... bug bumps!! Thank you! It was cool to do so much... whew. Yes, bravo on all the work--and getting up that high on the ladders! I saw The Shed profiled on a couple of food shows--one one Food Network and another on Discovery or TLC, can't remember which. It sounds neat! Hee! 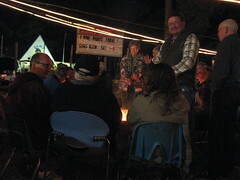 It was very neat, and very informal and very comfortable for everyone. That was very nice. And, yeah, I now know that it's easier to do the shorter ladders after the tall one. You're really doing great moving through all of this! I hope the digestive issues calm down too. Nuts woman. you're nuts. That's too high without any safety line. It's good the crew worked so well together. It always makes a difference in how much gets done. Ugh with the bugs. I feel for you, but it sounds like you're doing an incredible job.